On Sale Now! 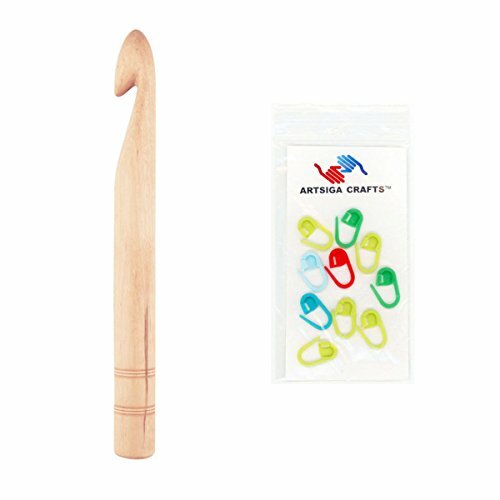 Save 6% on the Knitter's Pride Jumbo Basix Single-Ended 6-inch (15.5cm) Crochet Hook Size 35.00mm Bundle with 10 Artsiga Crafts Stitch Markers 600620 by Knitter's Pride Knitting Needles at Designers Artists. MPN: KPAB6006201P. Hurry! Limited time offer. Offer valid only while supplies last. Bundle includes 1 Knitter's Pride Jumbo Basix Single-Ended 6-inch (15.5cm) Crochet Hook Size 35.00mm with 10 Artsiga Crafts Stitch Markers 600620. Bundle includes 1 Knitter's Pride Jumbo Basix Single-Ended 6-inch (15.5cm) Crochet Hook Size 35.00mm with 10 Artsiga Crafts Stitch Markers 600620. Birchwood needles now in Jumbo sizes are perfect for big knitting projects. Needles have amazing strength, smooth finish and allow for easy, effortless movement of yarn. Has the lightness of birch and the strength of natural wood and ideal for today's chunky yarns Now available up to Jumbo size 25.00mm (US 50). Provides hours of pleasurable knitting with no hand fatigue. Warm to the touch, and gentle in the hand. If you have any questions about this product by Knitter's Pride Knitting Needles, contact us by completing and submitting the form below. If you are looking for a specif part number, please include it with your message.